So how are you going to play the on-line dating game? Will you adopt a proactive strategy and send messages to everyone who interests you? Or will you just post your details, sit back, and wait for potential partners to get in touch with you? As ever in life, by daring to take the initiative we expose ourselves to the possibility of rejection. But if we’re lazy or shy about contacting others, statistics show we greatly limit the possibilities of finding ourselves a date. In on-line dating, the key to success is to get yourself noticed. Here, those who dare, win! A compelling profile is a must-have to let the world know you exist and persuade others you’re someone they want to date. So don’t be reticent about selling yourself! Like it or not, this is a marketplace – and a vast one, at that. Don’t be afraid to talk openly about your qualities, and don’t let lack of confidence hold you back from presenting yourself in the best light. Bear in mind, though, that describing yourself in a humorous way is a far better tactic for winning others over than taking yourself too seriously!. Remember too, that your personal statement isn’t set in stone, and if you’re not getting the kind of results you’d hoped for, you should change it as often as you need to. Don’t be tempted to dash it off quickly without properly thinking it through. Because this is, in effect, your shop window to the world, it’s worth making a bit of an effort. Choosing an up-to-date picture rather than one taken several years ago is also very important. If you looked better then than you do now (and don’t many of us! ), your date is likely to feel disappointed and cheated when you meet face to face. Then you’re off to the worst possible start. Again, it’s worth spending a little time and money creating a really good photo. The more professional it appears, the more attention it will attract (and don’t forget, that’s the name of the game!) Take a number of different shots to choose from and use image editing software to show yourself at your best. Together with your photo, the first thing likely to stand out about you is your user name. On the basis of these two pieces of information, most people take only a few seconds to decide whether to go on and read your profile. So getting it right is essential if you’re playing to win. Choosing a racy or a wacky name may seem to you to be a bit of fun, but can create the wrong impression if you’re actually not that kind of person. So make sure your user name reflects the kind of image you really want to project. The purpose of a user name is of course to protect our identity, but there’s no reason why it shouldn’t tell others something about our personality and our hobbies. As always, if we can do this in a positive and amusing way, we’re one step in front of the competition. If you genuinely want to fall in love, be prepared to relax your search criteria! Okay, there will be certain basic must-haves and deal-breakers which need to be included. But remember, the more criteria you use for your search, the fewer matches you’re going to find! By limiting yourself to a tight age range, a particular set of physical characteristics or the sort of individual you normally consider to be your “type”, you’re ruling out a whole bunch of possibilities that could really surprise you. Falling in love is all about that elusive thing called chemistry, which is so notoriously hard to find. Certainly, you can rarely tell from someone’s photo or personal profile how well you’re likely to click with them – how often does a prospective partner look great in cyber space but prove a let-down in real life? Now, though, there’s an effective way of finding out about your potential compatibility before getting too involved. First expand your horizons and your options. 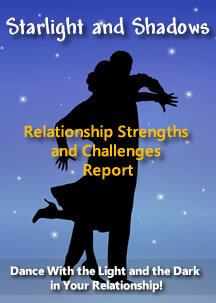 Then use AstroReveal's COMPATIBILITY STAR RATINGS feature to select the matches where you register the highest scores! With online introductions, the rules of play tend to be a bit different to other forms of dating and here there’s no reason at all to stick to one prospective date at a time (in fact it would be a mistake to do so). Bear in mind that this is a numbers game and the whole point of internet dating is to give you plenty of choice. Initially then, at least, you can have lots of potential dates on the go, while you’re checking them out, one by one, and getting to know a little more about them. So okay, it may take a while to find the right person, but the secret is to relax, be patient, and enjoy the process. Working through all the various options – and coming up with all kinds of fascinating revelations along the way – is for many people the best part of the game! Dealing with Rejection - How to Cope When You've Been Dumped!